This polyurethane leather Apple iPad pouch carrying case has a very natural looking grain on surface as well as giving your iPad full protection. So you need a protective case for your expensive new iPad? Something simple yet refined? You have no need for fancy folding smart covers and stands but want a quality cover with a professional look to it. This brown leather pouch is for you. 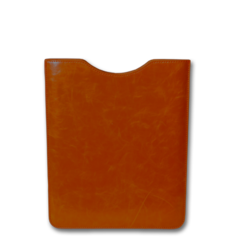 The vintage style PU leather is soft, yet tough and extremely durable. Your iPad2 or new iPad model slips into it for snug secure protection but when you want to use it you can pull it of its velvety scratch free micro-suede living for a completely naked, full functional iPad exactly as Apple designed to be used. 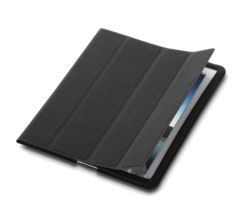 Do you have an iPad 2 and like Apple's Smart Cover technology, but hate that it doesn't cover the back? We have the solution for you! Instead of getting a whole new case, which is an add-on to the Smart Cover, you can just get this case. It looks like the Smart Cover, it's made of the same material as the Smart Cover, and it locks and unlocks the device ... Just like a Smart Cover. Features: Condition: 100% Brand new and High quality! Compatibility: Compatible to Apple IPad 2. Perfect fit to all corners, connector jacks, Camera lens, speaker, screen, and buttons. All function buttons and ports are available without taking off the case, and you can easily install or uninstall the case without any tools. Compatible with any iPad2 model. 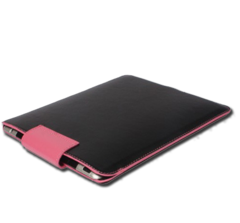 Case Buddy iPad 2 Sleeve Covers come in Pink, Blue and Black.